Are you looking for eco-friendly kitchen countertops in Maryland, Northern Virginia, DC, Baltimore, Columbia, Ellicott City or the surrounding areas? When it comes to choosing green kitchen countertops, you want durable materials that still make your kitchen look beautiful. Let us help you find the perfect counters while reducing your impact on the environment. Keep reading to learn more about our luxurious selection of countertops for the eco-friendly kitchen. If you would like to speak with a kitchen countertop installation expert, give us a call at 410-712-0601 for answers to all your questions. Click here to contact us online for a FREE estimate. Environmentally friendly countertops for kitchens are becoming more in demand as families become conscious of their carbon footprint. Choosing eco friendly counters doesn’t mean you have to sacrifice the style and image of your home and kitchen. It simply means you are choosing to support the earth with counters made of recycled materials. Using recycled materials minimizes the release of dangerous emissions. How? The materials already exist! All we have to do is re-process them into safe and beautiful counters for your kitchen. You don’t have to sacrifice style or durability when choosing to go green. Many surfaces are even heat and stain resistant, but check the specific guidelines for your material of choice. At Express Countertops, we understand the kitchen is one of the most important rooms in your home. We also understand the importance of finding a product that is durable, functional, and fits the image of your home. Our eco friendly countertops are built to last! We fit our products to the needs and demands of your kitchen. Do you have an island? Double sink? Our installation services cover all of the details for a perfect fit. 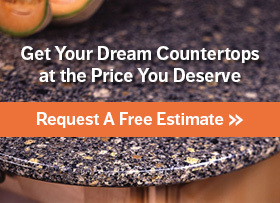 Contact Express Countertops for a Free Estimate! Call us today at 410-712-0601 or click here to contact us online to request a free estimate and speak with a representative about any questions you may have. Express Countertops stands behind our “one week installation guarantee.” We are solely dedicated to delivering countertops and only countertops to our customers. As soon as you make a decision, we are prepared to begin installation. If you’re looking for green kitchen countertops in Maryland, Baltimore, Columbia, Northern Virginia, Ellicott City, DC, or the surrounding areas, your search is over! Let us make your kitchen a highlight in your home.